1) People who drive with their blinker on for miles and miles with no actual intent on merging lanes or turning. 2) Raisins. They make me gag. I tend to get all excited about the thought of packing, since it means I’m going away on a trip. Then the novelty of the excitement quickly wears off, and combined with my grand pitfall of procrastinating, the actual packing of my bag becomes a disastrous mess; the only possible way of salvaging it is to kick and scream in a tantrum on my bedroom floor with a mixed drink in one hand and a bottle of Xanax in the other. The one thing I learned, and boy was it a fun one to experience, was the less, the better. Now I know what you’re thinking…. “Of course, you idiot. EVERYONE knows that.” But before I fell in love with traveling, I used to be that chick that took a 29 inch suitcase to Las Vegas for two nights. If that sounds like a nightmare, imagine to my surprise when I took that exact same suitcase to my first European trip for two months. Camping. Yep, I rolled that baby over rocks, through mud, and even hurdled over it to get to my sleeping bag….. IT WAS A NIGHTMARE. I did much better the next European trip with a ginormous backpack, but that too weighed me down. So I decided that this time, I’m taking the challenge and attempting to pack for TWO MONTHS in a carry-on! First and foremost, there are a few supplies needed (in my opinion) to make this possible. Even if you aren’t planning on condensing your life down to the bare necessities, these are the items I believe you should have to have to be organized and efficient. Because let’s face it, there’s nothing worse when traveling than having to constantly tear through your bag to find something. Unless we are talking about bed bugs. Or parasites. Or zombie raisins. Or maybe losing a limb while cage diving…. You MUST have a fantastic bag. For this “pack my life into a carry-on” mission, I have chosen eBags Mother Lode TLS Weekender Convertible. This baby has loads of pockets and zippers, and surprisingly, it’s very spacious. It also expands, so I should have plenty of room for any small purchases I make while I am traveling. The inside has two separated compartments, which nicely and perfectly fits the next item on the list…. Aside from a spectacular bag, I will not go anywhere without my packing cubes. These suckers have saved my sanity. I love watching other travelers in hostels make a disaster out of their folded clothes, and I just smile and laugh inside at how much better life is with some cubes. The cubes come in all sorts of sizes, and all you need to do is simply ROLL your clothes, stuff ’em in the cube, and that’s it. Also, rolling creates LESS wrinkles than folding! 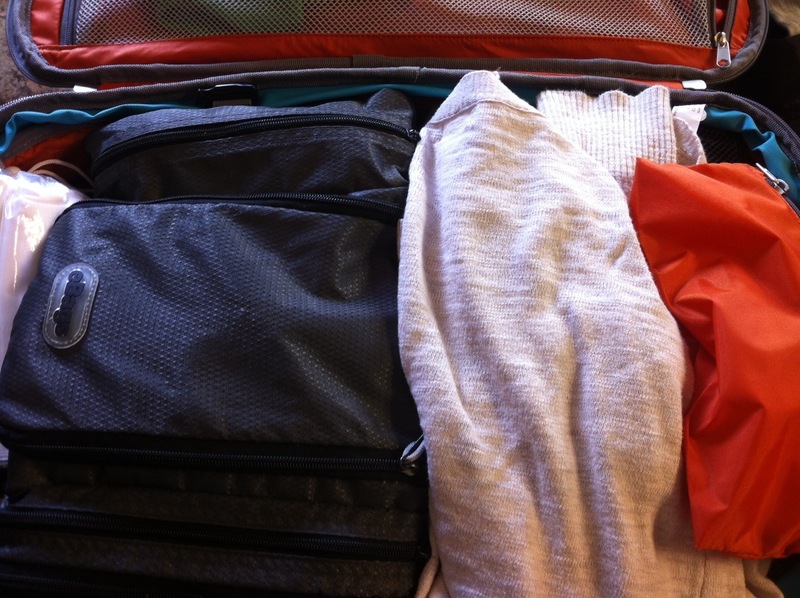 I can get two months of clothes into ONE packing cube… not bad, eh? Again, I use eBags cubes, which are available in different sizes and quantities pending your needs. I feel like this is probably more for my lady readers, but my number one issue with packing lighter isn’t clothing, it’s the stuff I “need” to get ready with. I’m a huge fan of all the fun oils and creams, but that sure isn’t getting past airport security. Unless I bribe a fellow passenger to take some of my liquids for me, but I’m sure I would be called in for questioning and be potentially subjected to a full-cavity search. Not fun times in my book. Unless the security person doing the full cavity search is Cristiano Ronaldo… Then search away, my friend. Search away..
Now that we’ve got our top three necessary items, all we need to do is condense, condense, condense. This means lay everything out on the bed and take at least HALF of everything and put it back away. You don’t need it. Oh yeah, you’re about to wear the same thing over and over again…. But don’t worry about having to do laundry every few days; after a few weeks, you’ll quickly become extremely lazy and accept the fact that you’re wearing the same shirt, unwashed, for weeks on end. It’s ok. Note: Most of my clothing was treated with Permethrin, a highly toxic chemical that helps in the prevention of ticks and mosquitoes making a meal out of me while in Africa. Clothing– 2 pairs of shorts, 1 pair of jeans, 1 pair of leggings, 1 pair of capri yoga pants, 4 assorted color tanks, 4 t-shirts, 2 buttoned short-sleeved shirts, 1 buttoned long-sleeved shirt, 1 hoodie (or jumper, for my global readers! ), 1 cardigan, 1 bathing suit, 1 packable rain coat, 1 sports bra, 6 pairs of socks (Not pictured: 2 bras, 7 pairs of underwear… I have to keep some things private! 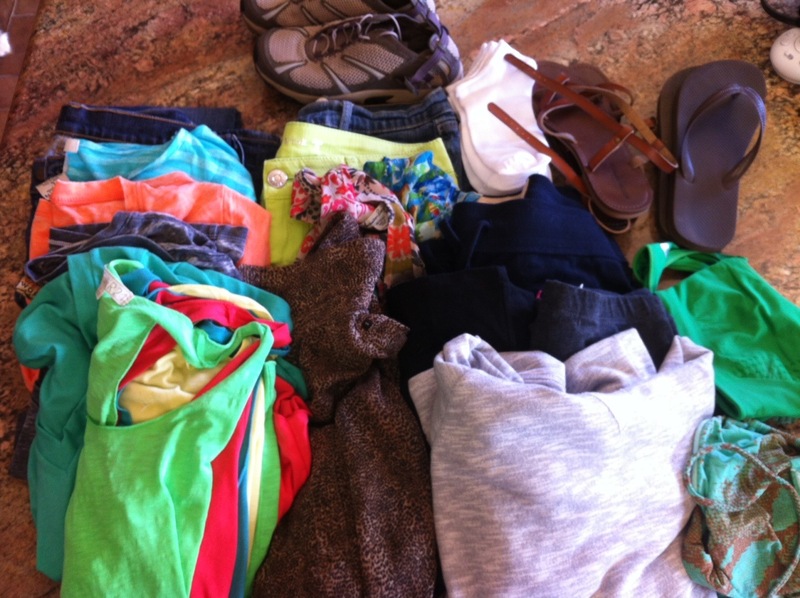 ), 2 pairs of sandals and 1 pair or shoes. MacBook, Camera, iPhone, iPod, Beats by Dre, two South Africa dual power adapters (yes, two.. I once blew one up in London, so I’d rather be prepared), power strip with two outlets. Sanitizer wipes, Deet wipes (a major necessity for not being munched on alive by Malaria infested ‘skeeters), 5 weeks worth of Malaria pills, two different cold medicines, cough drops, anti-poops medicine, ten chapsticks of different varieties. (Editors note: The Bean has an insane addiction to chapsticks. It’s a real issue. The normal person probably doesn’t need that much. She is a freak), first aid kit, three travel-sized packets of sunblock. 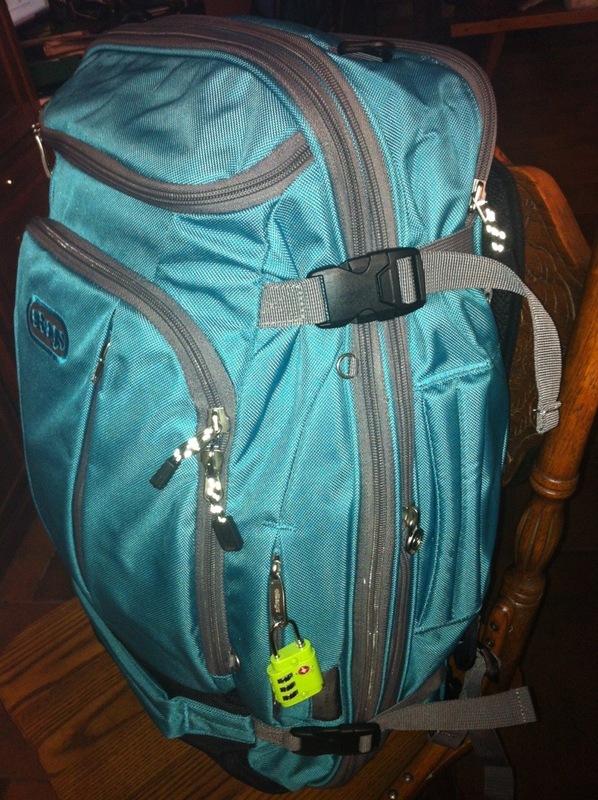 Three waterproof bags for electronics/passport, traveling alarm clock, PacSafe 20l daypack, PacSafe security web (in case I feel the need to securely lock my bag, especially if no lockers are provided), packable duffel bag, travel toilet paper (laugh away.. until you find yourself in a crappy situation with no t.p…. ), sleep sack (to protect my epidermis from nasty bedbug bites. It’s happened before, and it was awful! ), laundry soap sheets, dryer sheets, bleach pen. 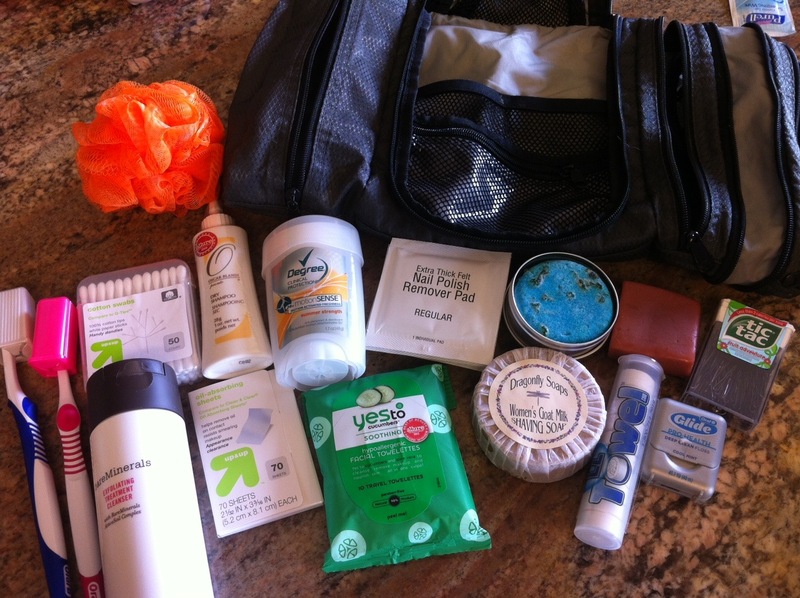 All of my toiletries fit perfectly inside the eBags Pack-it-Flat toiletry kit. (You’d think I was getting paid by eBags to sell their products, but unfortunately, I am not. I just think they make really great bags for a really great price!) This kit is amazing, as it packs flat, which made it perfect to throw it over my cubes inside my bag. In my kit I packed: loofah, two toothbrushes, Q-tips, dry shampoo, blotting papers, make-up remover wipes, deodorant, nail polish remover pads, EZ-towels (one of the single greatest items ever made), floss, solid shampoo and conditioner and a tic-tac case full of bobbi pens. And last but not least, I have my handy-dandy snack pack, full of fruit rolls, almonds, gum and beef jerky. I actually thought I wouldn’t be able to get any of my snacks to fit, but they fit perfectly in the very back compartment, which is set for a laptop, but in my case, snacks! I will carry my liquids in my small daypack, which consists of 5 2 oz bottles of my favorite hair product by Macadamia Natural Oil, one 2 oz tube of Smashbox BB Cream, Josie Maran intensive argan cream (AMMMMMMAZING product!!) and one 2 oz bottle of waterproof make-up remover. Now I’ll breeze right through departure and arrival without having to check my bag or hunt it down! Plus, not having lots of extra space limits my spending, which for anyone who has traveled with me before knows all too well. 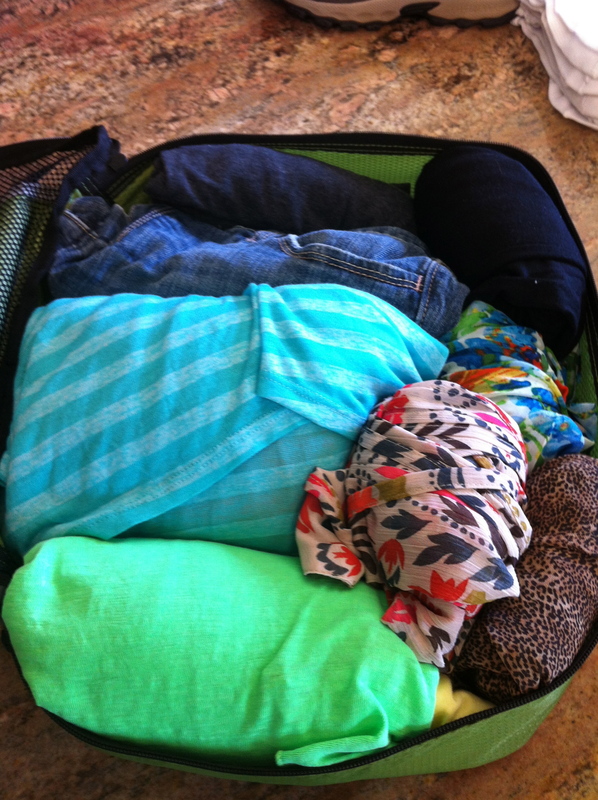 Do YOU have any fun packing tips to share?! I’d love to hear them! What cube sizes would you recommend for this backpack? And I’m just now noticing that this article is from 2013, so do you think this backpack held up well/would you still recommend it? Thanks! Thanks, Tammy! It’s helpful to know it works for my readers! Those teeny LED flashlights are great for those ” What the heck is crawling on my leg ??! ” moments ! Eeeeeeeeew!!! I wish I had one when I was eaten alive by bed bugs in Venice! Or maybe not…. I probably wouldn’t have wanted to see them…. Never mind! oh, also when you’re there – get biltong. lots of it. it’ll put beef jerky to shame. I’ll definitely try some!!! Thanks! Good lessons learned, thanks for the info. Have a great trip, we will miss you. Cant wait to see your nwxt post. My favorite was the packing cubes, very cool. Thanks! I wish I could pack my life in cubes!! I’m off travelling with my husband in just over six weeks and I’m worried about the toiletries thing. I wash my hair daily (super-greasy!) so I HAVE to have a good supply of shampoo. The lush solids had been recommended to me by others, and I went to try some on Saturday. They all STANK. Really strong, unpleasant smells. Which one do you use – have you used it before, is it as strong on your hair as it is on the block? 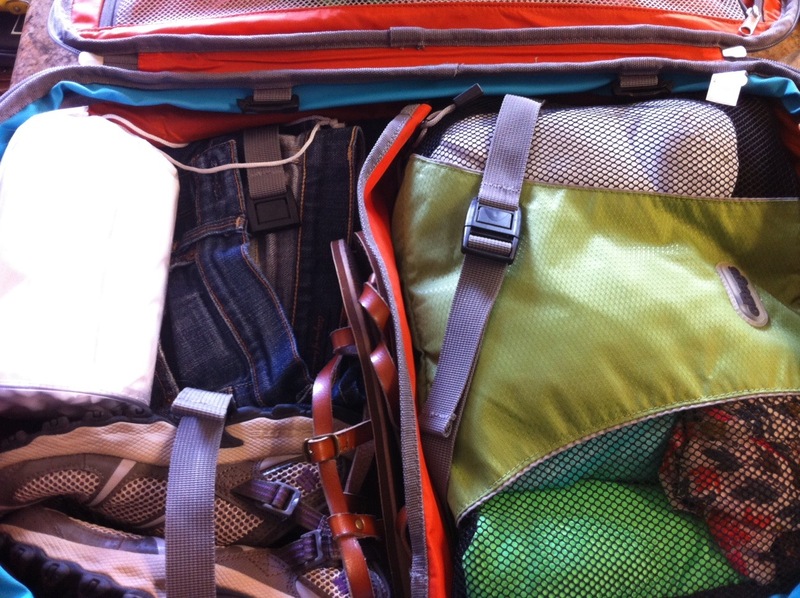 The packing cubes are a great idea. I’m going to look to see if I can get anything of a similar value in the UK. Thanks! The lush soaps are very strong, I agree. And I too have to wash my hair daily (yay for greasy hair)… But, the one I use (seanik) lathers really well, surprisingly well, and the scent is more beachy than anything. I hate their solid conditioners, but luckily I stumbled upon the one I listed from Fortune Cookie Soaps. It’s the best solid I’ve come across!